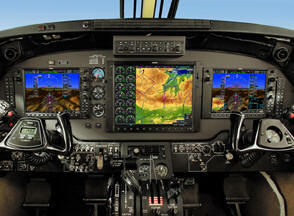 May 16, 2011 - Garmin a global leader in satellite navigation announced a special G1000 retrofit offer exclusively for owners of EU-registered Beechcraft King Air 200 and B200 aircraft in conjunction with this year’s European Business Aviation Convention & Exposition. EU King Air owners who place an order for the G1000 integrated flight deck prior to June 30, 2011 will receive a $15,000 discount on the Platinum package, an upgrade that includes Synthetic Vision Technology and Garmin ChartView powered by Jeppesen. “With the recent EASA validation of this installation, we are excited for King Air owners in Europe to explore all of the benefits that come from upgrading their aircraft with this state of the art technology,” said Gary Kelley, Garmin’s vice president of marketing. Garmin received the European Aviation Safety Agency’s (EASA) validation of the U.S. STC (supplemental type certificate) for the installation of the G1000 in the King Air 200 and B200 in December 2010. Installation of the G1000 system dramatically modernizes the King Air’s panel and meets current European regulatory requirements including 8.33 kHz VHF Communication, VHF Com Immunity from FM radio broadcasts, B-RNAV, P-RNAV, RNP Approach (to LPV, LNAV/VNAV, and LNAV minimums), RVSM, SSR Mode S Elementary Surveillance (ELS), SSR Mode S Enhanced Surveillance (EHS), ADS-B-NRA (Automatic Dependant Surveillance-Broadcast in Non-Radar Areas), and TAWS Class B. The G1000 avionics suite integrates all primary flight information, navigation data, communications, terrain awareness, traffic, weather, and engine instruments on a large 15-inch multi-function display (MFD) and two 10.4-inch primary flight displays (PFD). The G1000 installation on the King Air 200/B200 includes the GFC 700™ three-axis, fully digital, dual channel, fail passive automatic flight control system (AFCS). The GFC 700 includes features you would expect in this class of aircraft such as coupled space based augmentation system (SBAS) approaches such as LNAV/VNAV and LPV. Standard features of the G1000 avionics suite include Class-B terrain awareness and warning system (TAWS), dual integrated solid-state attitude and heading reference systems (AHRS), and dual integrated digital air data computers. The King Air 200/B200 STC also includes Reduced Vertical Separation Minimum (RVSM) support. This will allow aircraft to fly more optimum profiles, gain fuel savings and increase airspace capacity. King Air owners interested in this panel upgrade should contact an authorized G1000 retrofit dealer for an installation quote and to place an order.